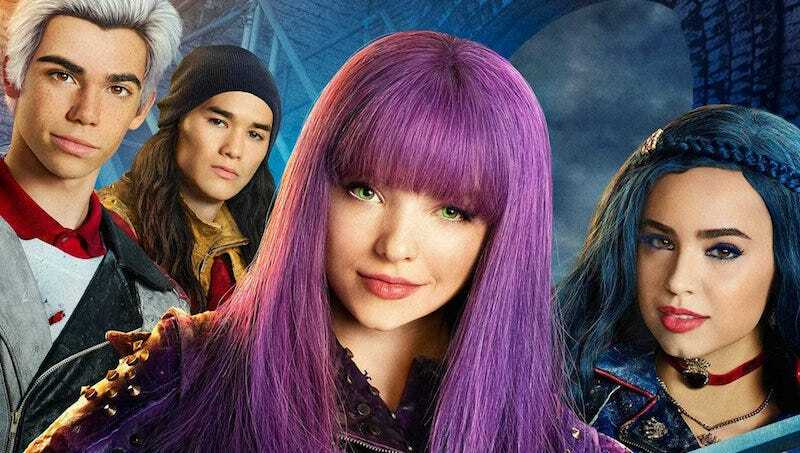 Hey all, who remembers Disney’s Descendants, a Disney Channel original movie about the children of fairy tale characters going to high school and that involved a number of very hilarious songs and improbable plot twists? Well, we’ve been hearing about the sequel forever and we finally have a premiere date. And it turns out it might be harder not to watch it. Disney announced that the sequel will premiere July 21 on five networks: Disney Channel, ABC, Disney XD, Freeform and Lifetime. That covers kids, adults, basic cable, and a network. All at once. A) The first part is impenetrable if you have not seen the first one (Mal is Maleficent’s daughter, Evie is the Evil Queen’s daughter, Carlos is Cruella’s son, Jay is Jafar’s son and they all live on the Isle of the Lost because when Belle and the Beast took over the world, they put all the villains on a prison island and any children they had while there I guess got punished too. In the first movie, Ben the son of Belle and the Beast is about to become king when his dad abdicates and he decides to bring the villain kids to his prep school on the mainland. Except, the sequel tells us, apparently only four of the villain kids, for some reason.) B) “VKs.” This is so dumb, I love it. C) Oh, sure, Ursula’s kid has a pirate gang. While trapped on punishment island. C) Look at Uma’s plan. This is why you don’t punish kids for their parents’ crime. It leads to a cycle of revenge only suited to Disney Channel musicals. Anyway, we’ll see all that on July 21. Will I be drunkenly explaining it as I did last time? You bet. Did Captain Hook Chop His Kid&apos;s Hand Off?